Summary of today’s show: Melissa Squarcia joins Scot to talk about the ministry of the Catholic Leadership Institute, which prepares clergy and lay leaders for leadership in the Church as well as assists dioceses in creating a strategic vision and priorities. As priests become pastors sooner after ordination and as they are spread more thin, CLI’s programs help them work more efficiently in order to accomplish the ministry goals at the heart of their vocations. 1st segment: Scot began by asking how we prepare our priests, deacons, and lay leaders for the Church of the 21st century. Parishes keep getting fewer and bigger and priests have more and more asked of them. And they didn’t always get the tools to lead in the seminary. The Catholic Leadership Institute is trying to help prepare priests and laity for more effective leadership in the Church and working with bishops and dioceses with strategic planning. 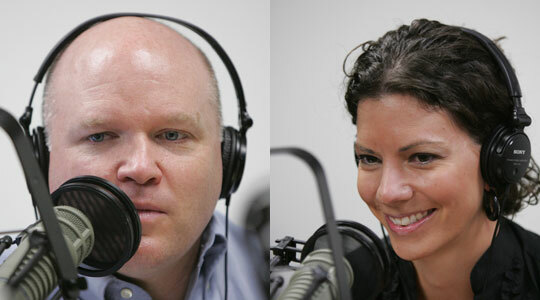 Scot welcomed Melissa Squarcia to the show. He asked how she came to CLI. She started about 4 years ago and before that worked for the local NBC affiliate in Philadelphia. They were looking for a communications coordinator to help share the good news about their ministry. CLI is 20 years old this year. Scot said it’s amazing what one person inspired in prayer can accomplish. The founder is Tim Flanagan and the co-founder as the late Fr. Charles Pfeffer. Originally they worked with youth and young adults, but as they started looking at where else they could work to assist the Church, they heard priests saying to the young people that they didn’t have the time to implement the good ideas. So they started Good Leaders, Good Shepherds, developing a curriculum that meshes the best of corporate leadership training with the teachings of the Church. They started in 2006 and are now in 60 dioceses nationwide, about 1 in every 3 in the US. Scot was impressed that Flanagan, who had a background that included in corporate leadership training, saw the need in the Church and committed to doing something about it. Melissa said the current president Matt Manion left a very lucrative and powerful position to come to CLI to serve the Church. Manion’s arrival allowed Flanagan to develop a board of directors, which aids in getting CLI out to a wider audience, including those who can provide support. Flanagan made a 10-year commitment to CLI in the beginning to see where it went. He made a plan and put it into action. If it was meant to be and God would bless it, then 10 years was a good time frame. Now 20 years later, CLI is helping so many leaders in the Church. Melissa said it was also a commitment by an all-volunteer staff that came onboard with Flanagan’s vision. There are 26 full-time staff in their main office outside Philadelphia, plus about 30 full- and part-time trainers who travel around the country running leadership training. The full-time trainers travel three out of four weeks per month. The priest-trainers are able to give 3 or 4 days per month. Scot asked how many of the staff are Villanova grads: Melissa said she is, as is Flanagan. Manion has a Master’s and there are three or four others who also have some affiliation with the university. Fr. Bill Dickinson joined CLI in 2006 as the organization’s National Director for Leadership Development. He’s been approved by his bishop to stay with CLI for another 5 years. Flanagan needed a priest to sell the nation’s bishops on CLI’s offerings and show them how it can be effective for their dioceses. 2nd segment: Good Leaders, Good Shepherds is the flagship program of CLI and Boston was one of the pilot programs. MElissa said it’s meant to help priests find more time and better ways to be a better leader and a good shepherd. Often their time is taken up with administration instead of bringing people the Word and sacraments. CLI says there are more effective ways to manage parishes and their workloads to free them to do what they became priests to do. Both GLGS and Tending the Talents have the same six contexts for leadership. The first is self-preparation for leadership, helping the person become more aware of their own leadership tendencies, strengths, and weaknesses are. Melissa said you have to be able to lead yourself first. The DISC profile they use help you increase your strengths and address your weaknesses. Scot said on the GLGS side, they integrate where the priest wants to be in six months, 1 year, and longer and what kind of priest they want to be. MElissa said they often have an idea of who they want to be when they leave seminary and all the pressures overwhelm them and obscure that idea. This helps them get back to the central idea of their priesthood. Scot said the central idea is becoming a priestly leader, not just a regular kind of leader. What makes Catholic leadership for priests and lay leaders different from leadership for corporate leaders? Melissa said the difference is shepherding after the heart of Jesus. The second module or context is leadership of self. Melissa said it includes creating your own vision and purpose statement, and formulating goals to help them accomplish that. It includes health and wellness, greater personal formation, and then more administrative and governance goals. They use the SMART goals concept: Specific, Measurable, Attainable, Realistic, and Timely goals. Melissa said it gives them focus and it puts time frames and parameters around their goals. The next leadership context is Leading in the one to one context. It includes helping a specific staff member get the most out of themselves. Melissa said it is one of the most frequently used contexts in leadership. It looks at their gifts and talents, helping them take the DISC profile, and establishing key responsibility areas and SMART goals. It helps them become more effective, freeing the pastor to serve the parish in a greater capacity because the staff members are able to carry out his vision for the parish in that specific role. Scot said there’s often fear around giving constructive criticism and there’s a science about this that’s passed on by Good Leaders, Good Shepherds. Melissa said that a lot of it is listening. She related a story from one priest who said his director of religious ed noticed the difference that GLGS was making in him, specifically that he now listens to her better when she speaks to him. 3rd segment: The next context is leadership of teams. A pastor’s life often includes staffs and committees. Melissa said it teaches the pastor how to charter, sponsor and give a vision to a team such that he doesn’t need to be present for them all the time. Thus they don’t have to be at meeting after meeting, but be assured that the team will accomplish the goals and purpose that has been created for them. It includes effective meeting management, recruiting of team/committee members. The idea is that people on the team itself don’t feel that the team is pointless. Another aspect of leadership of the team is keeping the teams on track, giving them a timeframe in which to get their job done (and not someone else’s job) as well as to prioritize. The priest-leader sets specific goals and time limits for every meeting with an agenda that has specific times to talk about each agenda item. The next context is leadership in the organization or the parish. Scot said a parish is a complex $1-1.5 million organization with a staff of employees, but also thousands of souls who need to be shepherded. Meanwhile many of our pastors are even younger than before, some becoming pastors just five years after ordination. Melissa said they have the priests set a vision for the parish, what this particular parish in this place and time is called to do. Then they whittle it down to all the bits and pieces that can bring the vision to reality. It gives them a context to proclaim to their people so they all know who the parish is serving and what they are called to do and be. Scot said some would ask why would Parish A’s vision be difference from Parish B’s vision. He would say every parish is different with different cultures, different places, and so on. In one parish, they might prioritize youth ministry. Another might prioritize a period of healing after a merger of two previous parishes. Melissa said every parish is called to lead people to Christ and manifest the Kingdom of God on earth, but every parish will do that in a different way, partly because the gifts and talents in the pews are different from one place to another. The next context is strategic relationships, i.e those organizations that function outside the parish, including soup kitchens or other parishes. For example, a priest asked his parishioners what they dream about to enhance their community and faith life. Many wanted to serve the community with non-Catholics in the area that serve the poor. So they work with nonCatholic churches to serve the poor and partnered with a Catholic parish in Haiti. Scot said the universal Church does not end at the borders of this parish. MElissa said this context helps the parish share the Gospel outside the parish community. Scot said about 40 or 50 priests ion the Archdiocese of Boston have gone through Good Leaders, Good Shepherds. Melissa said there have been about 1,600 priests who are enrolled or graduated including some from Trinidad and Vancouver. How does Tending the Talents differ? Melissa said it’s supposed to be complimentary to GLGS. A priest comes back with new leadership tools and the parish staff then goes to Tending the Talents to help them understand the new vision for leadership. They have a lot of the same leadership training, but do it knowing their pastor has already gone through it, which allows it to be anchored with deeper roots and reinforced. They can then also set their own goals and key responsibility areas instead of relying solely on the pastor to do it. 4th segment: Catholic Leadership Institute also works with bishops to help them with the same types of skills that pastors have received. Melissa said they are talking to the dioceses of Kalamazoo and Laredo to create visions and priorities which will help parishes align themselves with that vision. Scot said his experience is that most leaders have a vision, but they haven’t articulated it in a way that helps to align everyone to the direction they need to go. Melissa said it’s often about communicating the vision after putting it on paper. Just last week Bishop Bradley in Kalamazoo communicated that vision, which is to serve every person in their region, not just the Catholics. The vision is to be the Catholic voice there and all of the priorities are oriented to that vision. CLI is awarding four recipients an award for Catholic leadership on November 11 in Philadelphia. Cardinal Seán is one of the recipients. Also, Tom Monaghan, founder of Ave Maria University and Domino’s Pizza. Previous recipients have included Immaculee Ilibagiza, Matthew Kelly, Raymond Arroyo, Sr. Briege McKenna, Mother Mary Assmumpta, and many others. Much of CLI’s revenue comes from tuition for their programs, but any new initiatives or expansion of their work comes from donations.